Alright, time for an overdue review! 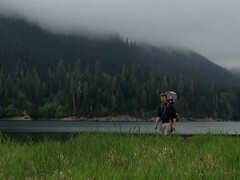 A few weeks ago I took an amazing hike up to Flapjack Lakes in Olympic National Park. This was my first major hike in Olympic NP and I got to the trailhead really late in the day (1 p.m.). That said, I was blessed with some great weather the entire hike and made it out just as the sun was setting. All told, the hike was 15 miles out and back, plus I think I hiked around the lakes for at least a mile. The scenery at the top was amazing with the Sawtooth Mountains rising up behind these alpine lakes and creating a gigantic natural amphitheater. Western Flapjack Lake with Sawtooths. Looking eastward over Eastern Flapjack Lake. = This difficult hike climbs some 3,200 feet, making for some steep uphills, especially on the Flapjack Lakes Trail. 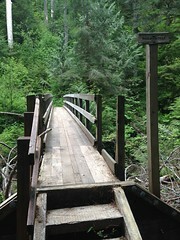 The hike begins at the Staircase Ranger Station and starts out on the North Fork Skokomish Trail, which gradually rises while following along the river. At about 3.5 miles, the North Fork Trail meets Flapjack Lakes Trail on the right. The 4-mile Flapjack Lakes Trail begins with gradual switchbacks before following and crossing Madeline Creek and then, within a few miles of the lakes, rises more steeply through a series of switchbacks. The last mile, past the intersection for the Black and White Trail, continues its steep ascension before gradually leveling out. A nice waterfall within a mile of Flapjack Lakes. = The trail was in moderate condition at best. The facilities at the trailhead and Staircase Campground were okay. Some of the trashcans were overflowing or missing. That said, I really recommend camping at Staircase if you prefer this side of the park. The campsites sit right along the river. The trail up to Flapjacks was in rough shape. There were several downed trees across North Fork Trail and Flapjack Lakes Trail. Also, I don’t recommend hiking either of these trails shortly after a rainy period – they are WET! Lots of rivers running through them. All said, the trail was well marked – it just needs some TLC. And the backwoods camping spots at Flapjack Lakes looked decent; some were located directly along the lakes and offered spectacular views. If this tree falls in the woods…someone will definitely hear it. Thank goodness for raised walkways. = I love Olympic NP (and Rainier NP for that matter) because they offer some amazing rural hikes and I don’t need to drive hours away to reach them. Both these national parks are practically in your backyard if you live in South Puget Sound. 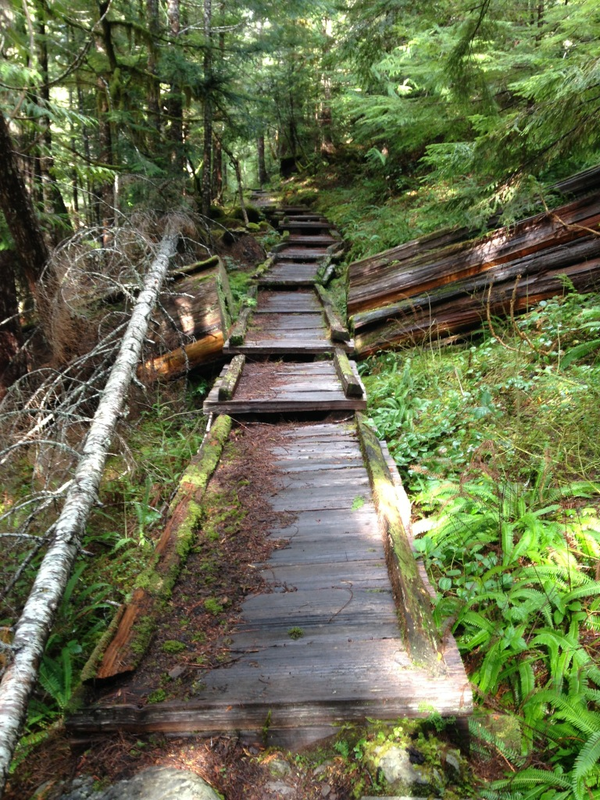 Furthermore, the Staircase area is one of the Olympic NP’s closest trailheads to Olympia. = You can’t get much more environmentally diverse then the Staircase area. This trailhead is a little out of the way, meaning it doesn’t receive as much traffic as other parts of the park. Also, the trails there traverse a wide range of terrains, letting you choose whether to follow along rivers, hike to alpine lakes, or summit some high peaks accessible from Staircase. Finally, most of the trails that begin at Staircase go through beautiful old growth forests (see my crazy tree photo below). 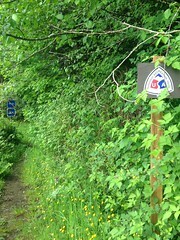 Where: The trailhead begins at Staircase Ranger Station, about 20-30 minutes up Route 119 from Hoodsport. Take the left turn when 119 hits Big Creek Campground. The road is partly packed gravel for about half the way. When to Go: I really recommend going to Staircase during the drier season. Every time that I go in the winter or spring, I’m often left with some wet boots by day’s end. That said, if you don’t mind hiking through trail rivers, any time of year will do. Just remember: the last mile of Flapjack Lakes trail (the part that goes up to the lakes) closes in the winter. I have no idea what the snowpack is like up there but I can tell you that there is little to no snow on North Fork Skokomish Trail during the winter. North Fork Trail remains open year-round. Spooky or dancing trees. Staircase Rapids Loop Trail. Trail Information: Make sure to bring a trail map. Check out the national park map online or stop in at the Hoodsport Ranger Station, located just as you turn unto Route 119 in downtown Hoodsport. If you want more detailed info about the trail, check out the Washington Trails Association review here. Also, you will need a national park pass or day access pass to park at the trailhead. Staircase Rapids, .5 miles from trailhead. The newish Staircase Rapids Loop Trail bridge – a neat cable bridge!